Hiking Italian Dolomites? Here are the most valuable guidebooks to discover safely the main sites. Currently available in French with lots of maps and drawings, each guide bought (pdf or printed) is delivered with gpx traces electronic files, which can be uploaded to any SmartPhone hiking application or to a Hiking-GPS. Volume 1: 50 itineraries in 14 areas around Cortina d’Ampezzo (2016 FR edition). Volume 2: 47 itineraries in 12 areas around Corvara (2017 FR edition). The volume 2 is 82 pages long printed in colors on format A4 paper. Volume 3: 50 itineraries in 12 areas around Caprile-Alleghe. The volume 3 is 92 pages long printed in colors on format A4 paper..
Hikers who prefer backpacking accross the Dolomites: we are proposing some connection routes. Modest hikers, and families with young children: we are fully describing wonderful routes, especially for them, whilst in parallel, for experienced endurant hikers, we have very nice routes with marvelous landscapes. You need a car to reach the starting points. For each area, a global map (illustrated: Volume 1 “Setsass – Col di Lana”) shows all proposed trails. For each trail, a map and a detailed comprehensive description is provided as a single page. Maps are extracted from Map data © OpenStreetMap. The itineraries are drawn from the GPS tracks taken from our hikes. 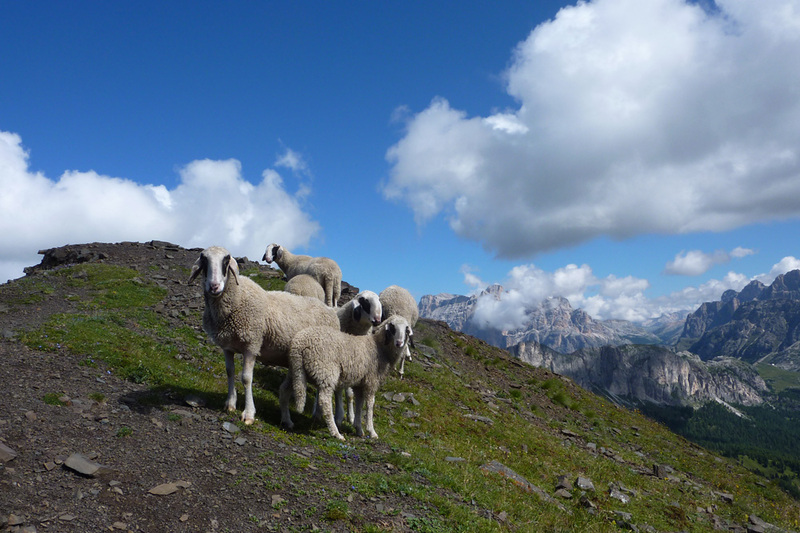 The description provides directions and refers to Dolomites hiking routes numbering. [ 3] Safety First ! Hiking Dolomites mountains cannot be considered as being without any danger. Whatever your skills are, please remember that hiking must remain a pleasure. Please do avoid taking unconsidered risks for yourself and for others. Our Guidebooks are aimed at providing enough guidance ensuring you hike safely on all our routes. Prepare your trip, choose your area, facts about the region are addressed in 8 pages packed with photos, informations, hints and remarks about mountains, valleys, via Ferrata, Historical events and lots of things to see and visit during your stay. Well appreciated and handy when discovering the landscapes. WayPoints mentioned in the description are highlighted on the elevation profile for each trail described. That is nice especially for beginners and for families walking with small children. They will tell you more about special spots and tales in the area. For each trail described, you can upload to your favourite GPS device, GPS Trace & WayPoints.